The transition from primary to secondary school is a milestone in educational life. It is a time of excitement and growth, with most children (and their parents) making the journey smoothly, however we recognise for some it can be stressful and challenging. At Whitefriars, we understand how important it is to provide boys and their parents with a strong sense of belonging so they feel comfortable and supported during this time. We adopt a whole school approach to transition, making each individual feel welcomed into this exciting, nurturing educational environment and the Whitefriars community. In Term 3 of Year 5. The family interview held in September serves to foster awareness of the ethos of the College and our values as College life is explained. The interview is designed to familiarise prospective students and their families with Year 7, answer any questions the family may have about Whitefriars and explain what to anticipate throughout the enrolment process. In Term 3 of Year 6, enrolled boys will attend a Student Assessment Profile session in the Duncan Centre. This is not an Entrance Test; your son’s entry to the College would already be assured. Utilising the expertise of Academic Assessment, we aim to establish a Student Assessment Profile for each incoming boy. This profile provides a broad range of information on each individual’s capacities in the areas of literacy, numeracy and general ability. We will continue to develop as comprehensive an understanding of each student as we can through the customary means of consulting parents, Primary Schools and other educational professionals. We believe that this Student Assessment Profile will also significantly assist us with your son’s transition to Whitefriars by helping us identify more clearly his abilities and needs and thus to focus more precisely our support of his learning. During Term 3 of Year 6, the journey continues. Our Transition Coordinator visits the enrolled boys’ Primary Schools. This gives the boys an opportunity to talk informally about questions and/or concerns they may have about Transition. The boys will also receive their Things to know about Transition to Year 7 booklet, which is full of information about Year 7, Houses and key dates, as well as their Passport to Year 7, which the boys complete and hand to their Pastoral Teacher on Orientation Day. This visit also provides contact between the College and the Primary school staff, allowing communication about each boy’s strengths and individual needs when considering their Year 7 class placement. 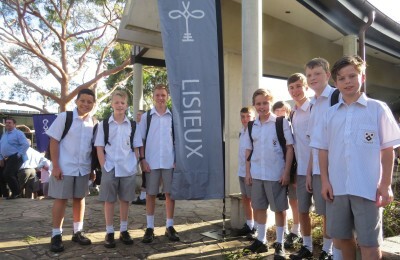 In November, Term 4, we hold the Year 7 Transition, Parent Information Evening. This is an opportunity for parents to meet key staff, and receive essential information to ensure a smooth and successful transition in Year 7. Then comes the day everyone looks forward to, Orientation Day. This is a very exciting step in the process as the boys finally find out which House they belong to and get to know their Head of House and Pastoral Care teacher. Their House Captain and Vice Captain along with Student Leaders from their House welcome the boys and spend time doing activities with them and showing them around the campus to further familiarise them with their new home away from home. These steps guide each boy and his parents on their Transition journey during Year 6. The support then continues into Year 7 through the Pastoral Care system and transition activities, such as the Year 7 camp. The Whitefriars family is committed to ensuring a smooth and enjoyable transition into secondary school.